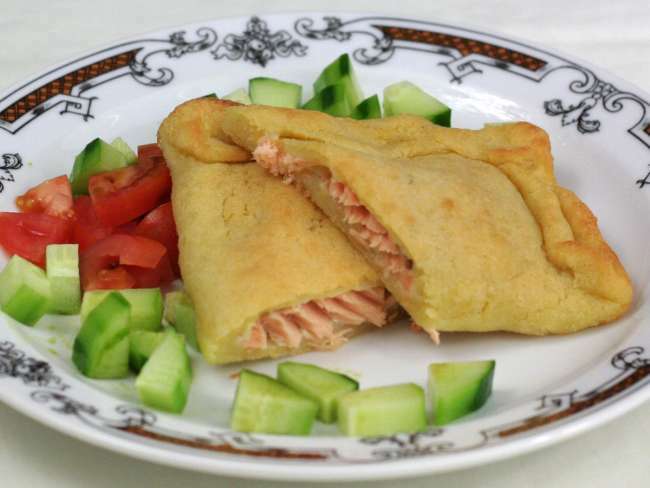 Baked salmon fillet in a soft potato batter. 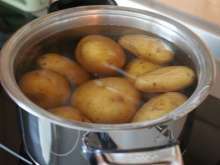 Boil the potatoes with skin and wit 1 tsp of salt for 25 min. 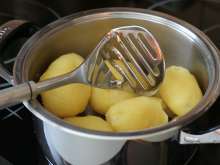 When cool, peel potatoes and shred them, making a pulp. 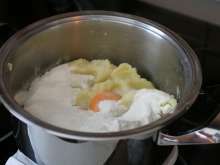 Mix the batter from mashed potatoes, egg yolk, salt and flour. 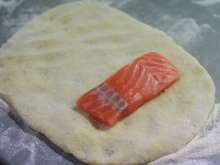 Knead the batter on a floured board and form it to a rectangle about 20 x 40 cm (according to the shape of salmon fillets). 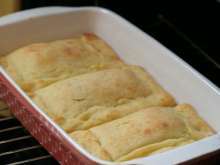 Put a pieceof fish onthe centerof one half of batter, cover it and push the edges. 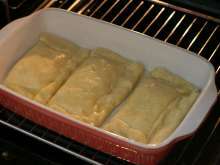 Place it on a greased baking sheet and brush with oil. Bake at 430°F (220°C) for 25-30 min until it is golden.